Set to release on February 21st of 2016, the Canon VIXIA HF R700 Camcorder makes it easy to create professional quality recordings with fantastic clarity and a wide assortment of advanced features. With a compact size, an incredible zoom, and full 1080p/60p recording capabilities, it packs plenty of value with a price tag just under $300. Built with the powerful DIGIC DV 4 Image Processor, your video will showcase the best balance of light for a brighter, fuller clarity that looks downright stunning. Equipped with an advanced 57x (32.5–1853mm) zoom, you won’t have to miss any of the action from a distance when you’re shooting video. This zoom gives you the ability to create videos with a variety of dynamics so you don’t disrupt any of the footage that you’re filming. The subject that’s being shot will stay clear and focused even when you zoom in and out at quick rates. This advanced zooming takes the telephoto power from 32.5 millimeters to 1853 millimeters so you’re given a wide range of options as to specific subjects that are in the scene. It’s the perfect solution for recording fast paced events like baseball, soccer, and football games, as well as fast moving targets like cars and animals. No matter what you’re filming, it does a great job at keeping the focus on point whenever you zoom. Nothing can be more frustrating than a shaky hand or a bumpy shot when you’re recording video. 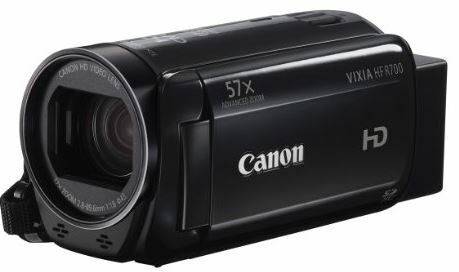 Canon knows this so they went ahead and added advanced Optical Image Stabilization to make sure that the footage with the Canon VIXIA HF R700 Camcorder is always steady and sharp as can be. It will automatically provide the proper balance of correction for an effortless quality shot. For wide angle focal lengths, it stabilizes the rotational camera shake by controlling five different axises. It plays a big part on creating smooth and distortion free video even when you’re walking or traveling on a bumpy surface. With the internal 3.28 Megapixel Full HD CMOS Image Sensor, you can capture all of your favorite footage in true high definition at a 1920 x 1080 resolution. It delivers the powerful sensitivity to create video with theater-quality definition that showcases the natural color of the frame, even if the lighting isn’t to perfection. Additionally, the Canon VIXIA HF R700 is equipped with an on-chip noise reduction feature that assures natural clarity in every single frame. When the footage is played on an HDTV, you can expect to see the true color and quality shine through in true 1080p. As an addition to the advanced HD CMOS Image Sensor, there’s also a DIGIC DV 4 Image Processor inside. This will do it’s part to capture the best quality in both dark and extremely bright scenes. This processing power gives you the ability to record in both AVCHD or MP4 format. AVCHD (Advanced Video Coding High Definition) is the preferred format for for high definition that was developed specifically for HD camcorders. MP4 is a quite universal file format that’s widely used all over the web, making it easy to share your video without the need to convert it to a different file type. Sometimes when you’re filming with a camcorder, you may not have chosen the appropriate setting for the best results in the current environment. Because of this, you’re left with a lackluster video file that could have been better. To our liking, Canon went ahead and equipped the R700 with Intelligent IS, a feature that automatically analyzes the shooting situation and chooses the best mode to film in. These modes include Dynamic IS (best for movements), Powered IS (best when zooming), Macro IS (best for close ups), or Tripod IS (best for stationary). Built with a bright and luminous 3 inch touchscreen LCD, the Canon VIXIA HF R700 Camcorder’s footage can be viewed with plenty of flexibility while you’re on the go. The screen measures 3 inches diagonally and provides a great view even in brighter or sunnier environments. With the on-screen layout, you can point and touch different functions with your fingers. You even have the ability to select a specific focal point so you can control exposure and track objects on screen while you’re filming. Navigating through the on screen layout is quite easy since it’s designed in a very user-friendly way. Once you touch a setting, it gives you a clear indication with an pop up menu that clearly explains everything that’s needed to be known. Since the VIXIA HF R700 Camcorder requires plenty of power to function at it’s best ability, Canon has made sure to include a high capacity battery. The BP-727 Battery Pack is a rechargeable lithium-ion battery that gives you several hours of filming before you need to charge it up again. Best of all, you won’t be left in the dark or have to play guessing games with the amount of energy that’s left in a charge. There’s an on screen indicator that’s paired with intelligent technology to provide the most accurate indication as to how much battery life is remaining. When creating your own home movies, it can be quite fun to have the ability to adjust the speed of the recording. There’s a feature that lets you record slow motion images at speeds down to 0.5x so you can film fast moving events or objects and slow them down to study or get the best look at a quick motion. 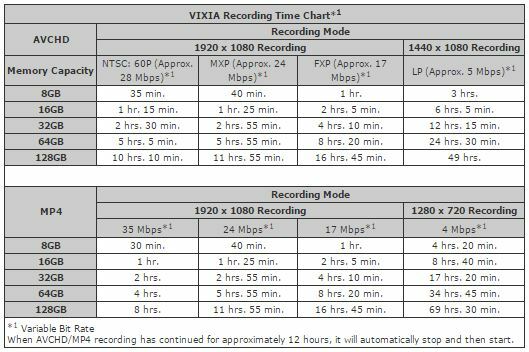 On the other hand you can do the opposite and record at an amazing 1200x for the equivalent of recording a 20 hour shot into a 1 minute scene. It’s a nice ability to have if you want to shoot something at a very slow or fast rate so you can really notice the finer details. To give the best range of tones and colors to your footage, the Canon VIXIA HF R700 Camcorder features a Highlight Priority Mode. This mode captures objects with saturated, realistic colors that look fantastic to the naked eye. It does this by reducing the mid to high brightness compression in the standard gamma mode so there’s never any loss in detail in areas of the scene that may be much brighter. With this mode, the videos will have a great effect on modern LED TVs with their brightness adjusted beyond the minimum. 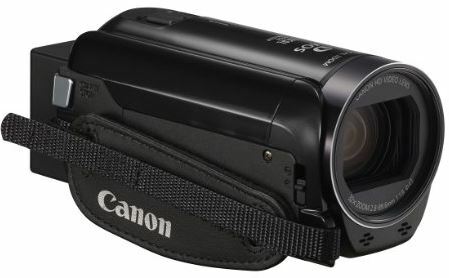 As far as value and overall high end features go, the Canon VIXIA HF R700 Camcorder doesn’t disappoint. Built with a high degree of excellence, Canon made sure to load it up with a wide assortment of technologically advanced characteristics. With an incredible 57x zoom that’s paired with image stabilization technology, you won’t have any trouble shooting video from a far and keeping it within an excellent range of quality. The 3 inch touch panel is a nice addition as it gives you full flexibility to the settings and the view at hand. Overall, we wouldn’t hesitate to recommend the VIXIA HF R700 to anyone looking for a high quality camcorder at a great price. 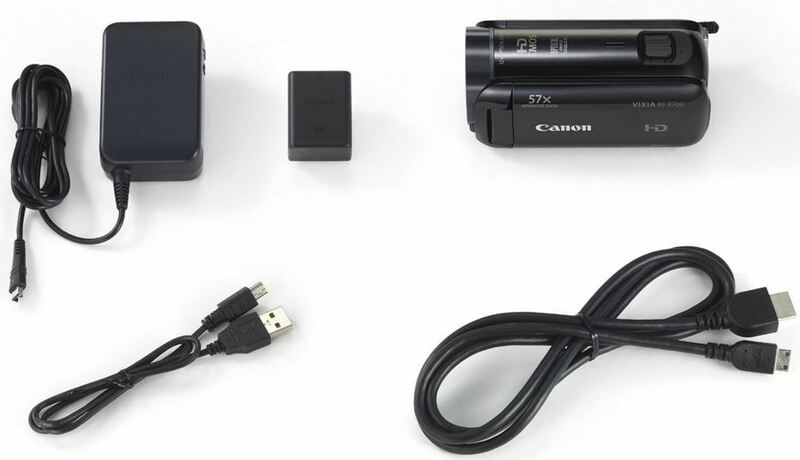 Does the Canon Vixia HF R700 camcorder have an external microphone jack or headphone jack? Yes, it’s equipped with a 3.5 mm stereo mini-jack. What is the sound recording quality? I will be using this for instructional music videos. It is quite good. I was at a party before and recording it. I could pick up more conversations that I heard myself. Just be aware that your finger can cover where the audio is picked up. I want to use it to film live bands! at bars… would the sound be distorted? How is it with live streaming? Specifically OBS streaming software onto YouTube. I’ve been working to do so, but I can’t seem to get it. Can the Vixia HF R700 also take pictures or can it only record videos? Yes, instruction manual says it can take pictures at resolution 1920/1080, which is an average quality. Is this camera NTSC or PAL? how do you take photos. please reply im having a hard time thank you. I’m curious what resolution this camcorder has for a still image?? Hello John, Accorsing to Canon, the VIXIA HF R700 shoots still photographs as Approx. 2.07 Megapixels (1920 x 1080). I own this device. I’m not an expert but i’m pretty sure most camcorders are not built to deliver high quality video in low light. You could try improving your lighting and getting some lighting fixtures. Try messing with the settings more. My camera did that also but I fixed it a tad bit. I am not sure how I did it but I know the video quality improved because of the differences of video before and after. There is no wifi option or capability for the Canon Vixia HF R700 but there is wifi capability for the Canon Vixia HF R70 and Vixia HF R72. Can i use the microphone with a canon hixia hf r700 camcorder? Can I use the small USB port to recharge or power the video camera when battery is low?